I decided to try to make some English Muffins. They are so expensive in the stores, about $6-7 for six muffins. 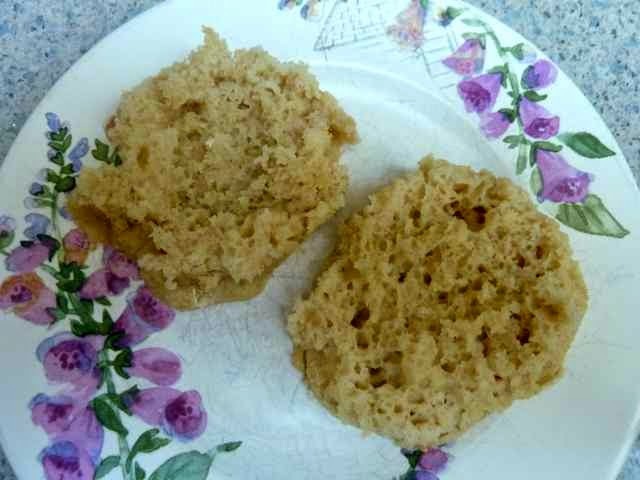 I looked for a wheat recipe that stated it was like Thomas’s English Muffins and converted it into a gluten free version. I was happy with the homemade results. The muffins were lighter and softer than any gluten free ones that I have bought in a store. They had the nooks and crannies when fork split and were pretty easy to make. The GF English Muffins taste really good and very much like a “real” one. All in all, a better than store bought experience that I will be repeating. **You need rings to make the muffins. Years ago the tuna cans opened with a can opener on both the bottom and top of the cans. Now only the top is opened with an opener and the bottom needs some work to get off. My friend took off the bottoms of some empty tuna cans for me, to use as rings. He used a sanding machine to file off the bottoms of the cans. 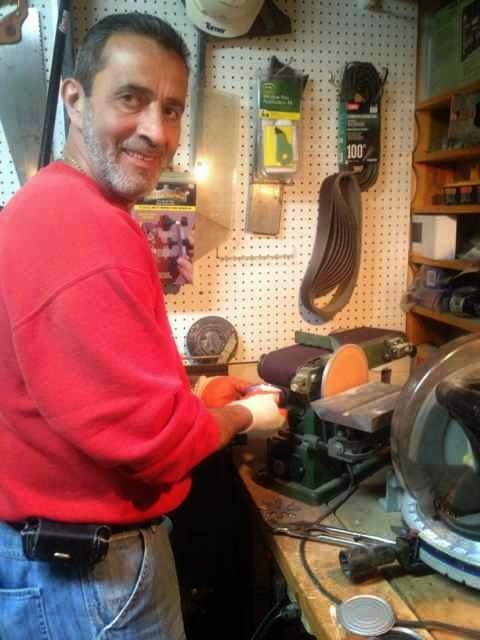 Even after sanding the edges are sharp and need to be handled carefully to avoid cutting yourself on them. You can make rings with pieces of aluminum foil folded over several times into strips and then tape or fold the ends together into circles. The rings should be at least 1 1/4 inches high and form a circle 10 1/2 inches in circumference and 3 1/4 in diameter. They sell rings in kitchen supply stores too, but that involves spending money before you know if you will ever make the muffins again. I made several batches of muffins with tuna can rings and one with homemade foil rings. The foil rings stuck a bit and were more difficult to get off than using the empty tuna cans. I think that the tuna cans are coated with some non stick coating. The muffins made with the foil rings had rough edges due to the sticking, but tasted great. I may not have greased the foil enough, perhaps more grease would allow the muffins to come out easier. Also greasing with shortening or margarine may work better than the vegetable oil that I used. My friend Eddie filing off the bottoms of the tuna cans for me. Eddie smiling for the camera. I cooked the muffins on a flat stovetop grill. You can also use a large frying pan or electric griddle. It only takes 5 minutes a side to cook. Take care with the heat. My second batch got browned much faster than the first and I had to lower the flame before cooking the second side. The idea is to cook the muffins for five minutes a side and get the bottoms lightly browned while the centers cook completely. A medium to medium low flame is best. I used a baking pan to cover the muffins while they cooked so that the centers would cook thoroughly. I don’t know how wheat batter is supposed to come out, the recipe seemed to indicate that it poured like a pancake batter. The GF batter was slightly thicker than pancake batter and required using wet fingers to smooth out the tops. The batter rose quickly, then fell a bit when I moved the muffin to the grill (with a spatula). To my relief the batter rose to the top of the rings again by the time the first side was cooked and the muffin stayed nice and light and fluffy. I also tried to make the recipe with an extra 1/2 cup of sweet rice flour. This thicker dough was easier to work with and handle. 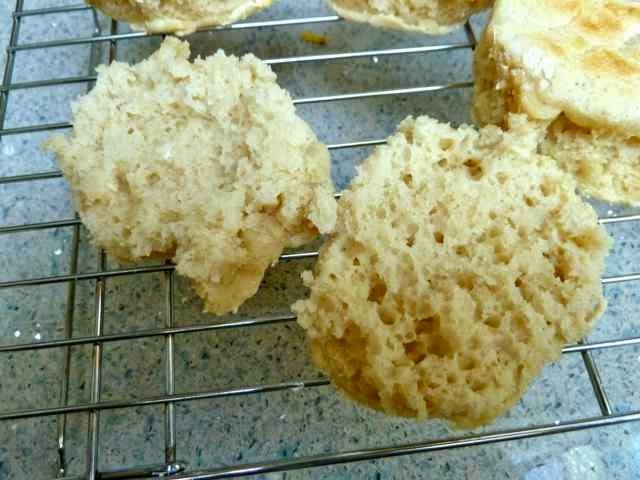 The muffins did not rise to the tops as with the thinner batter. 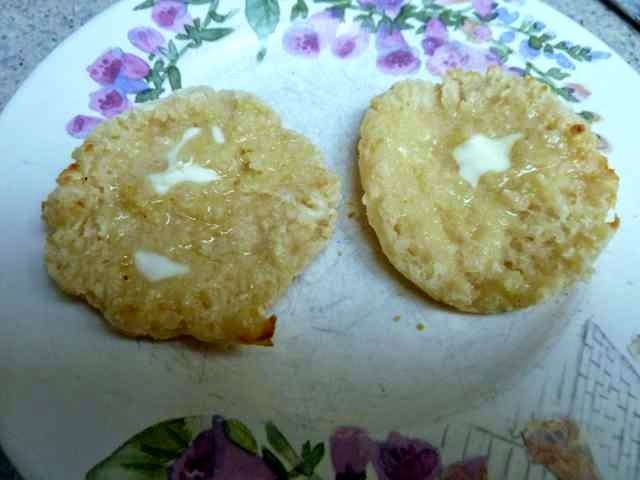 The extra flour made the English Muffins denser and not as light and fluffy as the ones with only 2 cups of flour, but still way better than any store bought ones and these were eaten up and thoroughly enjoyed. I am only mentioning using the extra flour in case anyone finds it too difficult to work with the thinner batter they can try using the extra flour. but the results are a denser (but still very good) muffin. 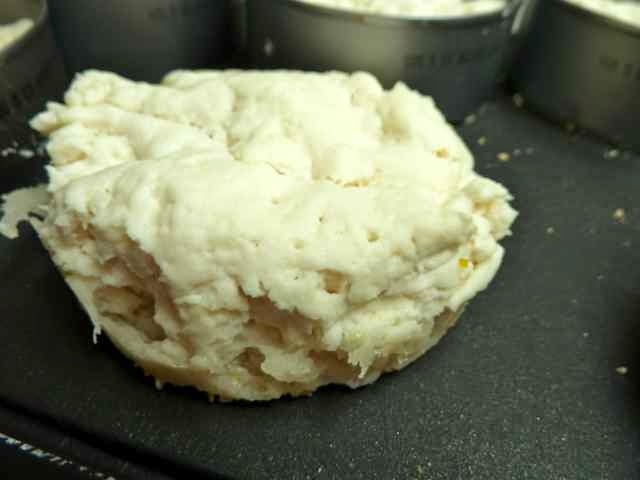 The English Muffin made with extra flour. These are denser and did not rise as much. I used almond milk in the recipe instead of dairy milk to keep it dairy free for my son. Many bread recipes call for the milk to be scalded. I looked up why. It seems that the boiling kills any bacteria (not really an issue these days with pasteurized milk) and enzymes in the milk. The enzymes in the milk (that can remain after pasteurization) can inhibit the gluten in the bread from working. Since there is no gluten in gluten free bread I deduced that scalding milk in GF bread recipes is not necessary. I just heated the milk to 110, a good temperature to proof the yeast. I tried several flour combinations. I like the combo I am posting the best for texture and taste. I also made a whole grain type muffin by using teff in place of half of the sorghum flour and millet in place of half of the rice flour and added a tablespoon of flax and sunflower seeds. It was very tasty and I enjoyed the whole grain type bread for a change. The whole grain muffins were just as soft and pliable as the “white” ones. I fork split the muffins after they cooled and then wrapped and froze the extra muffins to use later. I toasted the frozen muffins on the defrost cycle of my toaster, but had to toast them again to get them browned (could be my toaster). I am delighted to report that the toasted frozen English Muffins kept their soft fluffy texture. Now I plan to keep making double batches and freeze them so that I can have them whenever I like. So much better than store bought ones and you save money too. My wheat eating spouse was raving about them. This was a successful bread baking experience. Cook time 10-15 minutes depending upon your stove. 2 Tbs. Fine ground Corn Meal for dusting the pan. 1 Tbs. Sunflower or Flax Seeds or any combination of these seeds. Gather ingredients, set up cooking grill or pan. Line a baking sheet with parchment paper and sprinkle the corn meal evenly over the paper. Grease rings**(see notes above) and place on the prepared baking sheet. Rings on parchment paper sprinkled with cornmeal. Make a warm place for the dough to rise. Some people heat the oven to 200, turn the oven off and then place the covered dough into the oven to rise. I like to heat water in a microwave proof bowl in the microwave for 10 to 20 minutes while I make the dough. Then I place the pan with the dough (uncovered) into the (turned off) microwave to rise. The dough will need a warm place to rise for 40-60 minutes. Heat the milk to 110 degrees. Place about 1/3 cup of the heated milk in a small bowl. Add 1/8 tsp. sugar and the yeast. Stir with a spoon and let it rest. It should foam up in 10-15 minutes. Be sure not to make the milk too hot or it will kill the yeast. If the yeast does not foam up discard and try again or get fresh yeast. If the yeast is not working the dough will not rise. 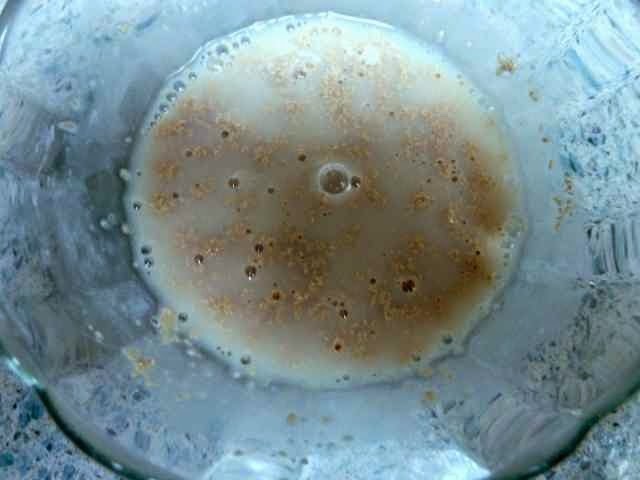 Yeast & sugar in warm milk. 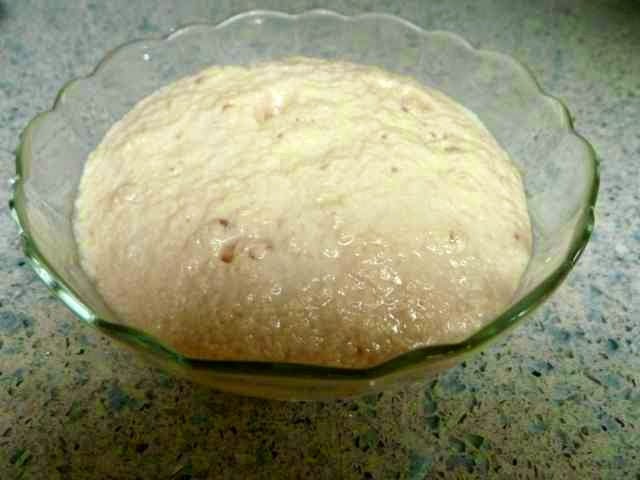 Yeast after sitting for 10 minutes. Add the sugar and shortening to the rest of the warm milk and stir until the sugar and shortening are dissolved. 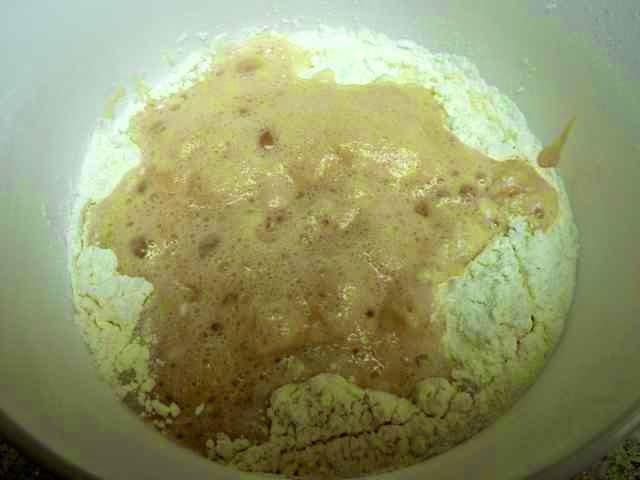 Add all the flours to a bowl, add the salt and xanthan gum and mix well with a whisk. For whole grain muffins add the seeds to the flour mixture and stir well. Add the proofed yeast and the milk mixture to the flour mixture. Mix together with a spoon or rubber spatula. Flour, milk and yeast mixtures. Yeast and milk mixtures added to the dry ingredients. Whole grain batter all mixed. 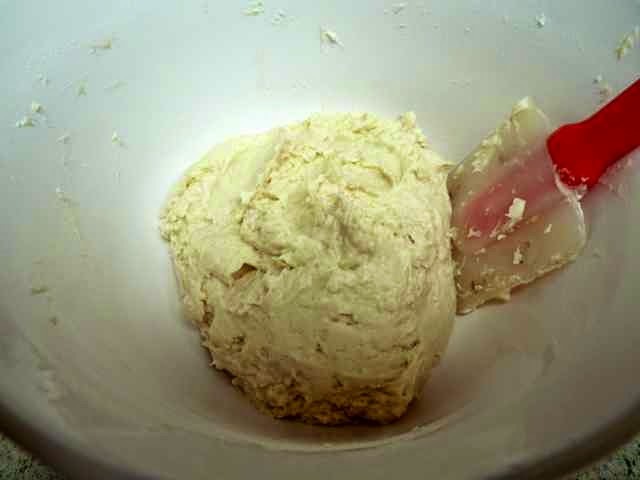 The white bread batter will be soft like this also. Divide the dough evenly between the rings so that the rings are slightly more than half full. I used 7 rings. 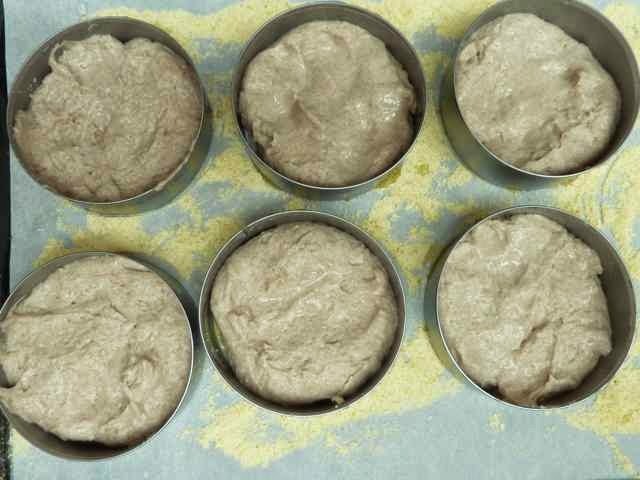 Use wet hands to spread the dough into the rings and to smooth the tops. Whole grain batter divided evenly between the rings. 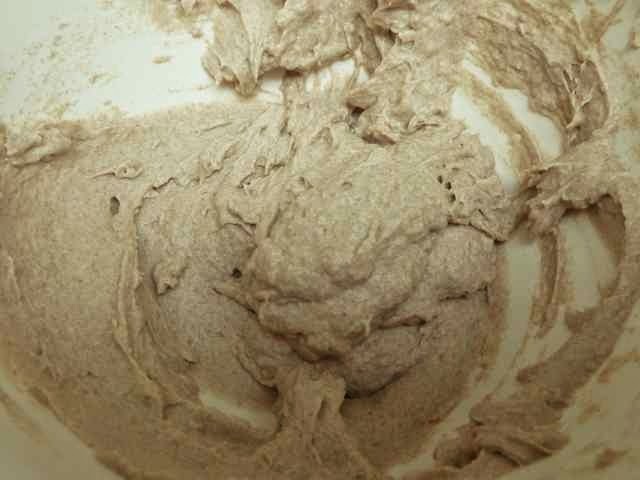 Batter after being spread and smoothed out with wet fingers. Place the muffins in a warm place to rise for 40-60 minutes or until it reaches the tops of the rings. My rings are 3 1/4 inches in diameter and 1 1/4 inches high with a circumference of 10 1/2 inches. The batter rose to the top of the rings in about 40 minutes. 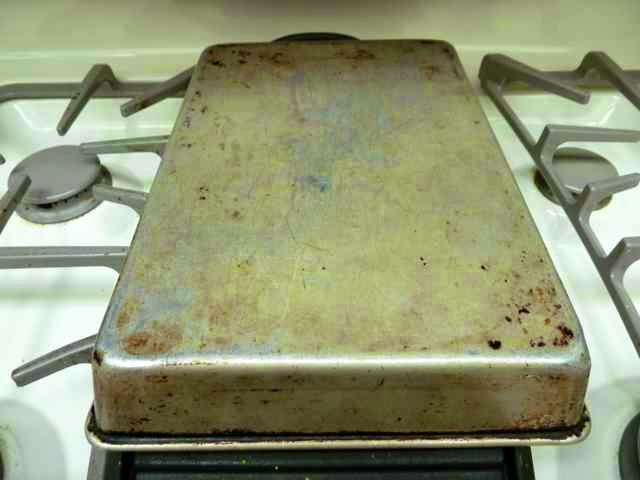 Heat the griddle, pan or flat grill top. Use a medium to medium low flame. Lightly grease the cooking surface with oil. Use a spatula to transfer the muffins to the cooking surface. 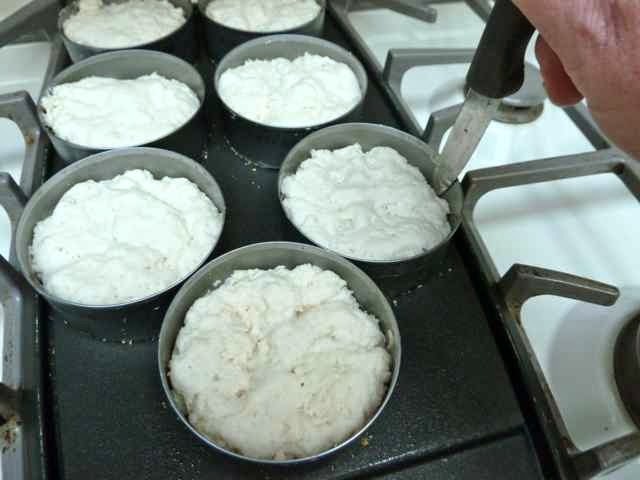 Don't worry if the muffins deflate a bit when they are transferred, they should rise to the top again while the first side is cooked. Muffins in their rings transferred onto the griddle. 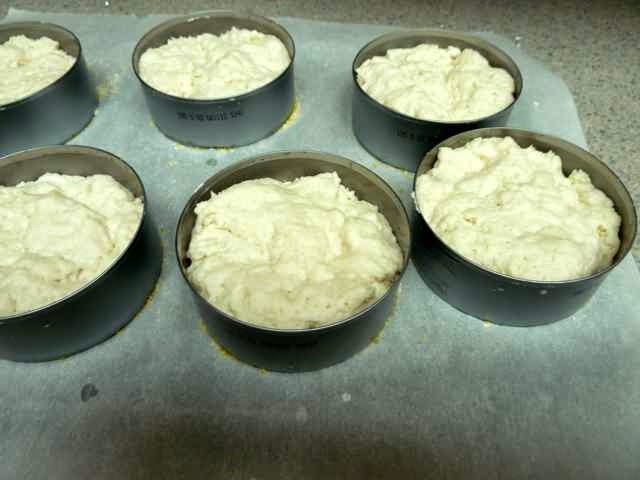 Cover the muffins with a baking pan while cooking to help the centers to cook thoroughly. Set a timer for 5 minutes. Take a peek after 3 minutes to see if the bottoms are browning and lower the heat if they are already brown. to help to cook the centers completely. After 5 minutes lift off the pan that is covering them and take the muffins off of the cooking surface. Then run a knife around the inside edges of the rings to separate the muffins from the rings. Shake the muffins out of the rings and then place the muffins raw side down onto the cooking surface. Cover and cook for 5 minutes. Again check the heat after 3 minutes and lower the heat as needed to prevent burning the outside of the muffins. Running a knife around the rings to loosen the muffins. One muffin, the bottom cooked, ring removed. 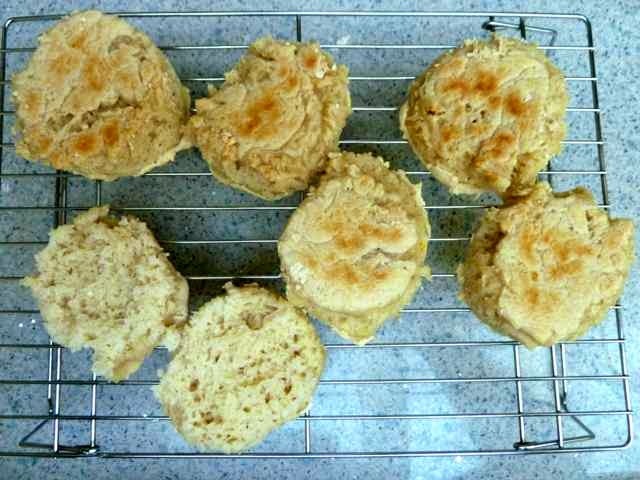 Remove the cooked muffins from the cooking surface and allow to cool on a rack. First side cooked is now on top. This is what the second cooked side will look like. When warm or completely cool you can split the muffin in half using a fork. If you try to split apart a hot muffin it will be too dense and sticky. Use topping of choice on the English muffin and enjoy. 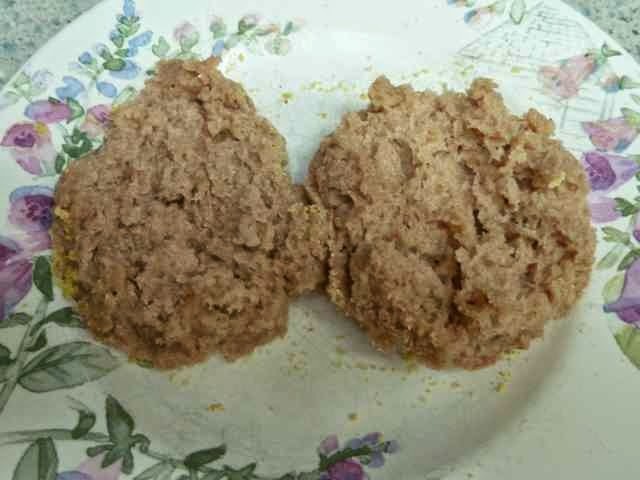 One English Muffin split open with a fork. Note the nooks and crannies. Best if eaten within 2 days. For longer storage fork split, wrap and freeze uneaten muffins. Just toast them as needed. 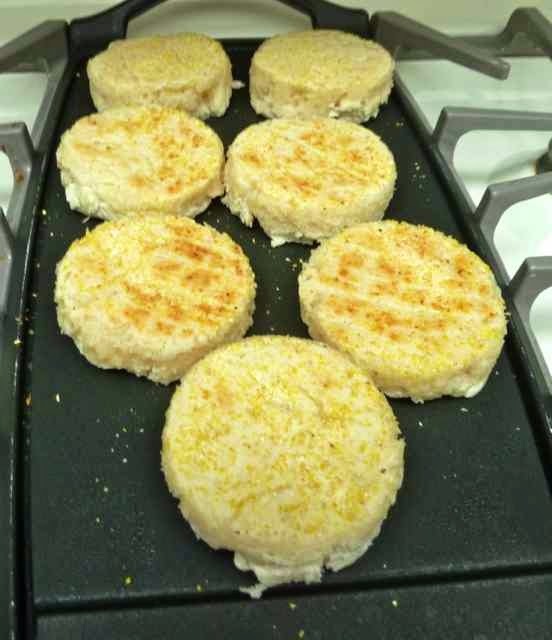 GLUTEN FREE ENGLISH MUFFINS Makes 6-7. Prep time 20-30 minutes. Rise time 40-60 minutes. Cook time 10-15 minutes depending upon your stove. 1 1/3 cup Milk (use whatever type you like dairy or dairy free) 1 Tbs. + 1/8 tsp. Sugar - Divided (I used evaporated cane juice crystals.) 2 1/4 tsp./1 envelope Yeast (I used Saf-instant yeast.) 1 Tbs. Shortening (non hydrogenated) or oil or melted margarine or butter 3/4 tsp. Salt 1 tsp. Xanthan Gum 1/2 cup Brown Rice Flour (extra fine ground) 1/2 cup Tapioca Flour 1/2 cup Sorghum Flour 1/2 cup Corn Starch 2 Tbs. Fine ground Corn Meal for dusting the pan. 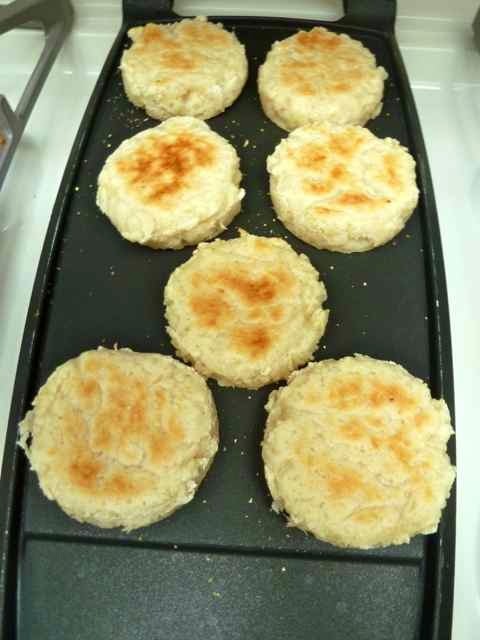 GLUTEN FREE WHOLE GRAIN ENGLISH MUFFINS 1 1/3 cup Milk (use whatever type you like dairy or dairy free) 1 Tbs. + 1/8 tsp. Sugar - Divided (I used evaporated cane juice crystals.) 2 1/4 tsp./1 envelope Yeast (I used Saf-instant yeast.) 1 Tbs. Shortening (non hydrogenated) or oil or melted margarine or butter 3/4 tsp. Salt 1 tsp. 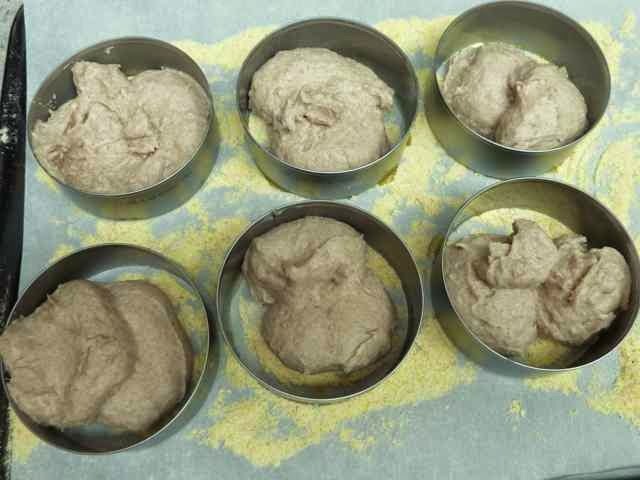 Xanthan Gum 1/4 cup Brown Rice Flour (extra fine ground) 1/4 cup Millet Flour 1/2 cup Tapioca Flour 1/4 cup Sorghum Flour 1/4 cup Teff Flour 1/2 cup Corn Starch 1 Tbs. Sunflower or Flax Seeds or any combination of these seeds. 2 Tbs. Fine ground Corn Meal for dusting the pan. Directions Gather ingredients, set up cooking grill or pan. Line a baking sheet with parchment paper and sprinkle the corn meal evenly over the paper. Grease rings**(see notes above) and place on the prepared baking sheet. 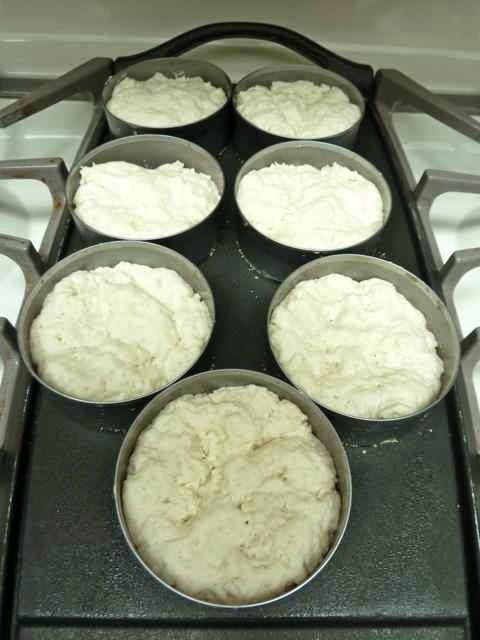 Make a warm place for the dough to rise. Some people heat the oven to 200, turn the oven off and then place the covered dough into the oven to rise. I like to heat water in a microwave proof bowl in the microwave for 10 to 20 minutes while I make the dough. Then I place the pan with the dough (uncovered) into the (turned off) microwave to rise. The dough will need a warm place to rise for 40-60 minutes. Heat the milk to 110 degrees. Place about 1/3 cup of the heated milk in a small bowl. Add 1/8 tsp. sugar and the yeast. Stir with a spoon and let it rest. It should foam up in 10-15 minutes. Be sure not to make the milk too hot or it will kill the yeast. If the yeast does not foam up discard and try again or get fresh yeast. If the yeast is not working the dough will not rise. Add the sugar and shortening to the rest of the warm milk and stir until the sugar and shortening are dissolved. Add all the flours to a bowl, add the salt and xanthan gum and mix well with a whisk. For whole grain muffins add the seeds to the flour mixture and stir well. 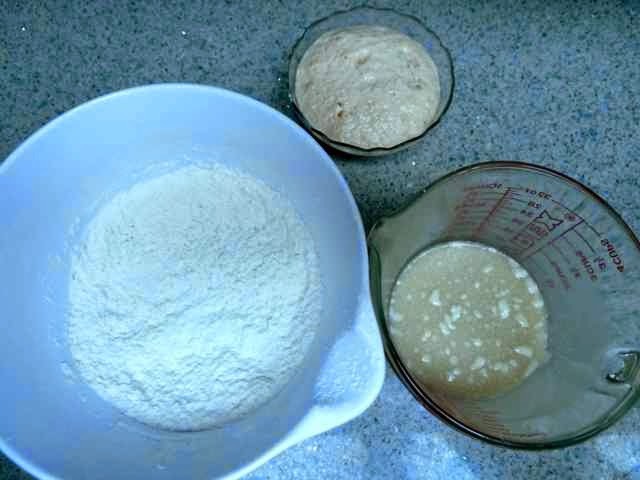 Add the proofed yeast and the milk mixture to the flour mixture. Mix together with a spoon or rubber spatula. Divide the dough evenly between the rings so that the rings are slightly more than half full. I used 7 rings. 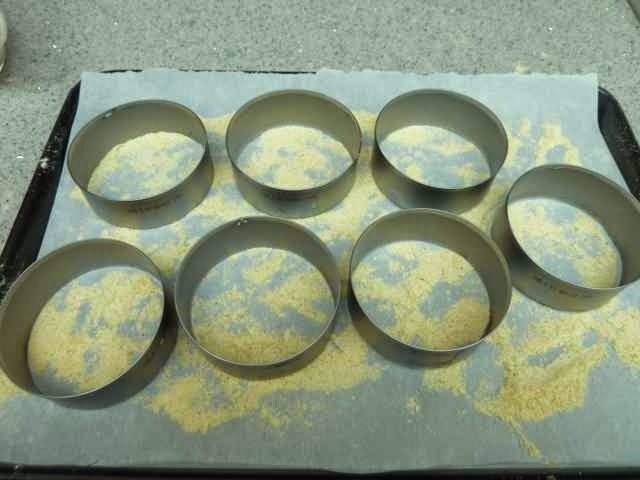 Use wet hands to spread the dough into the rings and to smooth the tops. Place the muffins in a warm place to rise for 40-60 minutes or until it reaches the tops of the rings. My rings are 3 1/4 inches in diameter and 1 1/4 inches high with a circumference of 10 1/2 inches. The batter rose to the top of the rings in about 40 minutes. Heat the griddle, pan or flat grill top. Use a medium to medium low flame. Lightly grease the cooking surface with oil. Use a spatula to transfer the muffins to the cooking surface. Cover the muffins with a baking pan while cooking to help the centers to cook thoroughly. Set a timer for 5 minutes. Take a peek after 3 minutes to see if the bottoms are browning and lower the heat if they are already brown. After 5 minutes lift off the pan that is covering them and take the muffins off of the cooking surface. Then run a knife around the inside edges of the rings to separate the muffins from the rings. Shake the muffins out of the rings and then place the muffins raw side down onto the cooking surface. Cover and cook for 5 minutes. Again check the heat after 3 minutes and lower the heat as needed to prevent burning the outside of the muffins. Remove the cooked muffins from the cooking surface and allow to cool on a rack. When warm or completely cool you can split the muffin in half using a fork. If you try to split apart a hot muffin it will be too dense and sticky. Use topping of choice on the English muffin and enjoy. Best if eaten within 2 days. For longer storage fork split, wrap and freeze uneaten muffins. Just toast them as needed.